IVYBRIDGE will go into the Christmas break sitting in second place in the South West Premier League table after a workmanlike 18-14 home victory over Cleve on Saturday. The Bridgers, having enjoyed a memorable late derby win at Brixham the week before, were far from at their best in the wind and rain against a fired-up Cleve side. But they picked up another four points that moved them ahead of Barnstaple, who lost to leaders Bournemouth. “By no means was it our best performance – we were quite disappointed with it – but before the game we knew the importance of just getting a win,” said player-coach Jamie Tripcony. “With Christmas around the corner and us sitting high in the league we targeted this game as we knew if we won we would still be in the fight. Had we lost it would have potentially said something about our character and the top two teams could have slipped away from us. So full credit to the lads, they had a cracking attitude. He added: “Cleve played really well. They played the conditions exceptionally well, especially first half. They kept on coming at us. They did put us under the cosh, but having said that our guys dug deep defensively and kept on making tackles. “We were frustrated they got over our line late on. The target was no tries, like last week, but they mauled fairly well in the bottom corner. With the wind and rain causing problems, the game at Cross-in-Hand never really got going, even on the artificial surface. Cleve, who arrived on the back of a 34-0 win over Exeter University, took the lead with an early penalty, but Ivybridge hit back when captain Charlie Briant scored under the posts and Billy Pinkus converted. Just before the break, Pinkus put Ivybridge 12-3 ahead with his 17th try of the season. Pinkus missed a penalty after the interval before Nathan Huntley put one over for Cleve to reduce the gap to 12-6. More penalties followed for Pinkus and Huntley as Ivybridge went 18-9 up going into the last 15 minutes. The visitors set up a nerve-wracking final few minutes for the hosts by scoring from a driving maul in the corner. DEVONPORT Services will start 2019 sitting in the top six of South West One after claiming an impressive 20-19 victory at St Ives. Saints had started the day in third spot and only leaders Launceston had previously won at their ground this season. But Services came from 19-3 down in Cornwall to return home with four valuable points in the bag. “It was a great win,” said team manager Kieran Leach. “It was probably our best win of the season. Devonport were without a number of key players in Cornwall, including captain Matt Gregory, who was a late drop out. Their back-row at St Ives was Luke Kenny, better known for being a scrum-half, Joe Semple and Mark Friend, but they really impressed in bad weather against a big Cornish pack. The wind was always going to have a major impact on the game and Saints had the advantage of it in the first half. They used it well to keep Services pinned in their half and take a 19-3 lead into the break. Services only got out of their half on a few occasions in the opening 40 minutes but Richard West did kick a penalty on one of those forays. But second half the game changed and Services started causing problems for their hosts. “Our patience was good in the second half and we didn’t panic,” said Leach. Services cut the gap to 19-8 when, after some good play by the forwards, centre Rhys Williams scored. Then number eight Friend showed what he has been doing for years with Tavistock by breaking from the halfway line and scoring under the posts. West converted to leave Services just four points behind. They then went in front when West put a grubber kick in and Sam Bennett managed to get on the end of it. Services did have forward Joe Daley sin-binned in the last 10 minutes but they defended brilliantly with 14 men to see out the game. 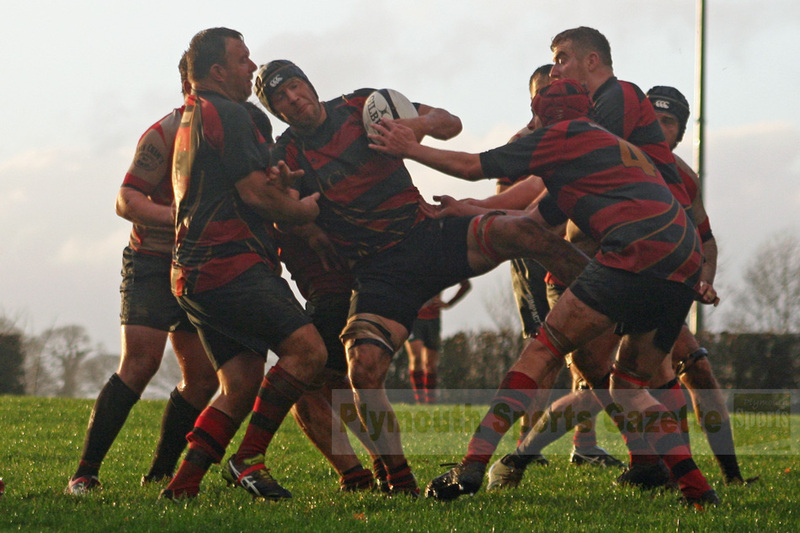 In Western Counties West, Saltash went down 45-22 at second-placed St Austell. The Ashes had pushed the Saints really hard at home before narrowly losing 22-19 at the start of the season. And for the first 50 minutes on Saturday there was nothing between the two Cornish sides. Saltash were actually leading 17-12 at the 45 minute mark, but then it all went wrong for the visitors within less than 20 minutes as St Austell scored five quick tries to go 45-17 up before the Ashes pulled a late score back. Kieran Down fired Saltash ahead with a penalty before Saints scored the game’s first try. But two more Down penalties put the Ashes 9-7 ahead. St Austell added a second try before Steve Hillman scored for Saltash after a good break by Lewis Wells to give his side a 14-12 half-time lead. That advantage was extended to 17-12 with another Down penalty before Saints’ purple patch. Phil Eatwell got Saltash’s late consolation try on a tough afternoon. Despite the loss, the Ashes stay in 11th spot and have not lost any ground on the teams above or below them, although they no longer have a game in hand. 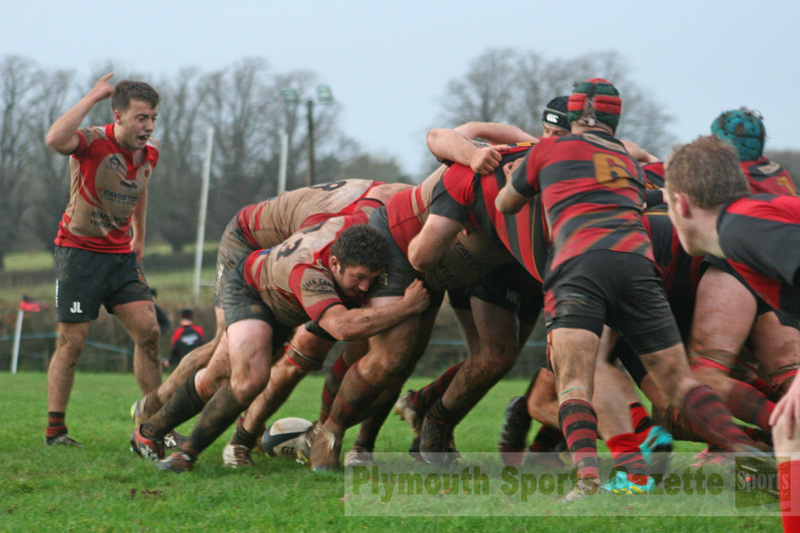 PLYMOUTH Argaum ended a five-match losing run with a hard-earned 12-5 victory at bottom side Withycombe. It was a much-needed win for Argaum, who had been getting dragged into a relegation fight. Their success on Saturday now means they have a nine point gap between themselves and the bottom three. 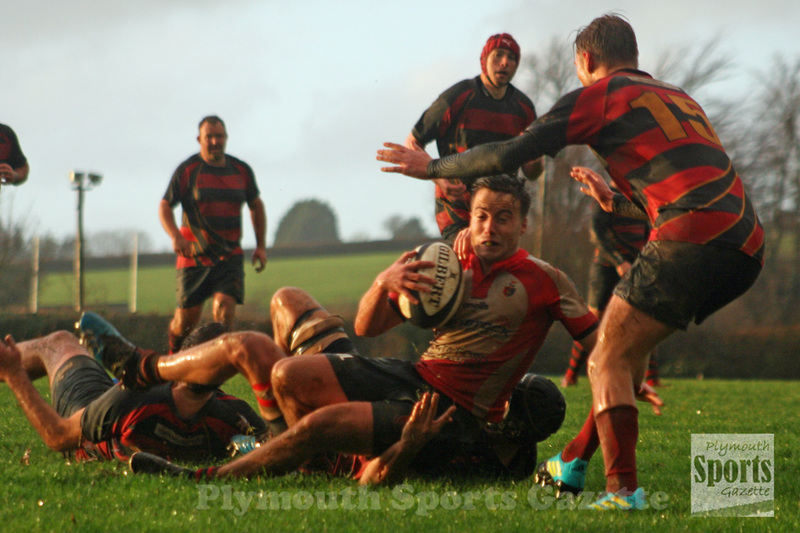 But Withycombe, boosted by the return of fly-half Glenn Channing, really made them work hard for the win in horrible conditions. The hosts led 5-0 at the break and Argaum, who had a number of late drop outs, really had to dig deep in the second half. “We were down at half-time and we really weren’t playing well,” said Argaum secretary Stuart Quarterman, who found himself as a replacement due to a no-show on the day. “But it was only 5-0 so we were down but not out. Tom Holliday pulled Argaum level with their first try and with just a couple of minutes to go, young recent signing Adam Walker scored to put his side ahead. But Withycombe threw everything at Argaum in the dying seconds and came so close to scoring. Plymstock Albion Oaks moved back up to third in the table after beating struggling Pirates Amateurs 12-7 at Horsham Fields on Saturday. Although conditions were horrible and Oaks got their 12th win in 14 games, player-coach Aiden Taylor was not happy. “We were awful,” he admitted. “It was one of our worst performances of the season, in my opinion. “We just didn’t play in the right areas, didn’t use the wind to our advantage and came unstuck at times, but we managed to grind out a result. “We just made error after error and played in the wrong areas. It was frustrating from a coach’s point of a view. “I know the conditions were awful, but it was frustrating not get a bonus point at home. The most frustrating thing for me was our error count, which was shocking. Relegation-threatened Pirates led 7-0 at the break thanks to a try from Ryan Stanley, which Steve Evans converted. Oaks, who have only lost twice this season, got back into the game after the interval when Taylor crossed for an unconverted try. And they sealed the win when second-row Tom Davies did well to put George Dunn in for a try, which Al Murray converted. Tavistock were another team left frustrated after they lost 11-5 at home to Liskeard-Looe, who had beaten them 39-0 earlier in the season at Lux Park. The match had to be moved to Tavistock’s sloping second team pitch, but strangely whichever team was playing uphill and into the wind played better. Liskeard had the slope and conditions in their favour first half, but never really used it even though they went in at the break 6-0 up thanks to two long-range penalties from Tom Dinnis. 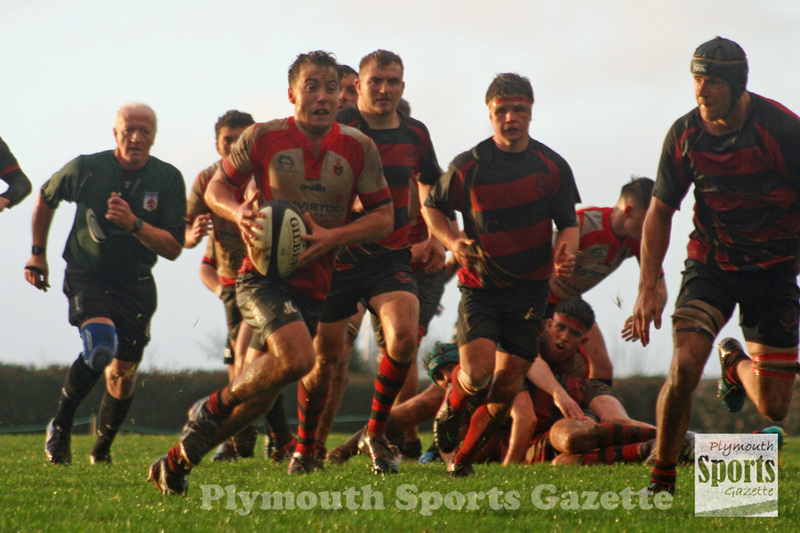 Like they had done the previous week against Plymstock Albion Oaks, Liskeard upped their performance for the second half and had a lot more possession in a game where clear cut chances were few and far between. Liskeard extended their lead to 11-0 with 10 minutes to go when following a good scrum they went right and there was winger James Rogers to cross in the corner. But that finally seemed to wake up Tavistock who then spent the rest of the game camped in Liskeard’s 22. And they snatched a bonus point with the last play of the game when captain Andrew Schuttkacker got the ball down from the back of a good five-metre scrum. Afterwards player-coach Hammy Kerswill said: “It was a game we targeted and it was a little bit disappointing. But first and foremost, credit to them (Liskeard-Looe) as they kept the ball really well in the second half. “It is a hard pitch to play. I think in the first half against the slope we probably had the better of it, even though we went in 6-0 down, but the second half we didn’t make the most of the slope. “The penalties were the difference second half and our scrummaging in the middle part was poor. He added: “If we haven’t have got that bonus point at the end it would have been a lot worse. We have gone from losing 39-0 down there to 11-5 here so that is a bit of a turnaround but it was not a complete turnaround. I think we have let a win go there. OPMs were well and truly brought back down to earth after their good win last week against high-flying Exeter Saracens by losing 6-3 at bottom side New Cross. New Cross did not have a single point to their name before Saturday but they picked up four thanks to a late penalty by teenager Lewis Short. The Kingsteignton-based club were boosted by a host of returning players, but OPMs know it is a game they should have won. “Our game management was poor,” said captain Billy Garratt. “In certain areas we probably should have kicked when we carried and other times we should have carried when we kicked. “We said in training that we couldn’t expect to go there and just win. We had to be confident but we definitely weren’t expecting what they turned up with. Supposedly they’ve had a lot of players back from injury and their defence was spot on. Short put New Cross 3-0 up at half-time with a penalty. OPMs’ Mark Wratton had missed a kick at goal in the first half but managed one after the interval to pull his side level. However, the hosts won the game when they were awarded a late penalty and 17-year-old Short calmly put it over. Old Techs’ Devon One match at Exeter Saracens and Tamar Saracens game at Exeter Athletic were both postponed due to waterlogged pitches. St Columba & Torpoint continued their good season in the Devon Merit Table with a 15-7 victory over DHSOB. However, fourth-placed Saints were disappointed not to pick up a bonus point in the match at a wet and muddy Defiance Field. The hosts dominated the opening period and deservedly took a 10-0 lead at the break. Lewis Stuart opened the scoring when he shrugged off several tackles to score. The dangerous Kieran Hurrell then added Saints’ second when DHSOB spilled the ball in their own 22 and he picked up to go over in the corner. 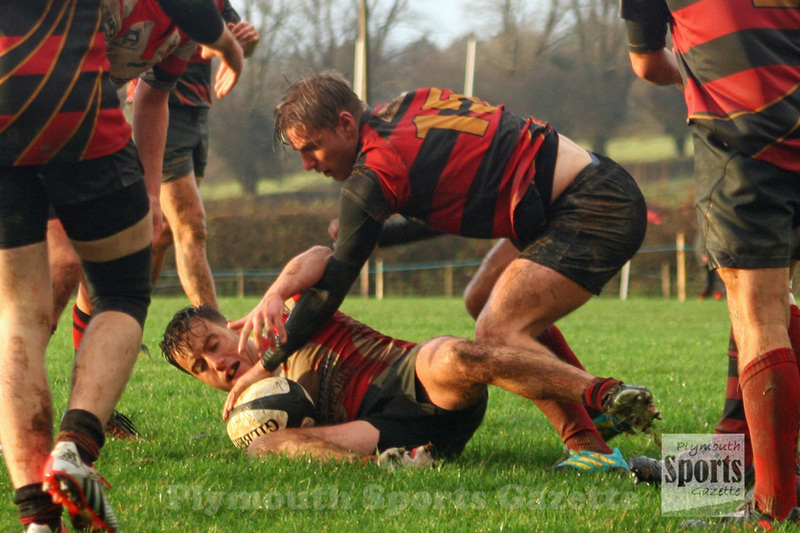 But DHSOB did defend well in poor conditions and denied their hosts any more tries in the opening 40 minutes. Saints wasted a couple of glorious chances after the break before Aidan Northcott did finally get their third, but they could not get an all-important fourth. DHSOB were better in the second half and JJ Hibbert made some good decisions with his kicking and centre Mike Jacot impressed. And the visitors were rewarded for their efforts with a late converted try. Please note copy and pictures on this website are protected by copyright and should not be reproduced on any other websites or social media or in any publication without permission.